I have a fascination with Turbine Cars and a couple of years ago I got to drive the one Jay Leno owns. How that came about is quite a strange story. I wrote a book about an event called the Italian Hall disaster, where 73 people died at a children's Christmas party when someone falsely yelled "Fire!" in a crowded theater, setting off a stampede. The book sold well and a bookstore in northern Michigan ran an ad suggesting Death's Door made a "Great Holiday Gift." Someone sent the ad to Jay Leno and he ran it on his Headlines segment. I got phone calls from around the country the next day from people saying they saw me on the Tonight Show. 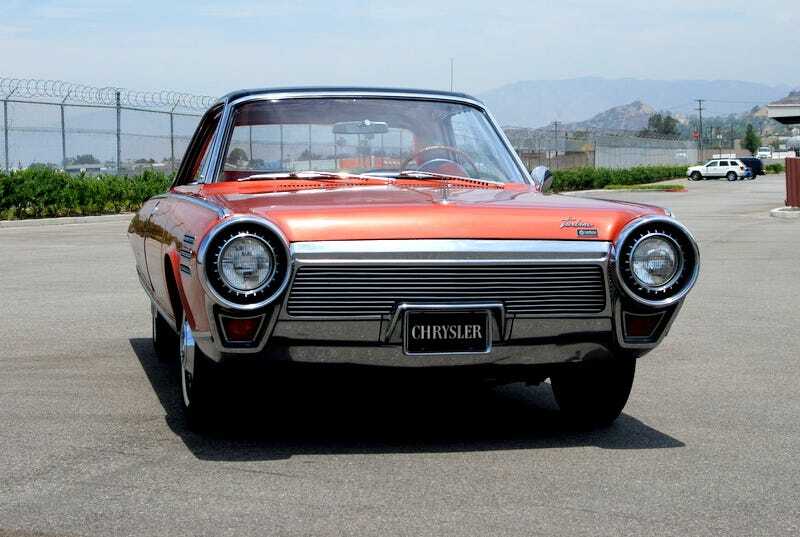 I had been working on a book about Chrysler's Turbine Car program and thought Jay might be interested in it since he is a well-known car guy. I took a copy of Death's Door (which Makes a great Holiday gift!) and gift wrapped it in gaudy paper and put a bow on it. I signed it, "Merry Christmas, Jay!" I included a note and a copy of what I had done on the Turbine Car. A few weeks later my secretary buzzed me. "A guy who says he is Jay Leno is on line one." She assumed it was a friend of mine who used different celebrity names each time he called. Jay got my package and told me he thought it was funny. And he enjoyed what I had written on the Turbine Car. He told me he would keep my number. A few years later, Jay bought one of the three Turbine Cars kept by Chrysler of the nine which were not destroyed (of 55 built). He called me again and asked if I could get him in touch with Bill Carry, a retired Chrysler technician who had maintained these cars back in the day. I had interviewed Carry and knew he would love to help Jay. I got the two of them together and later, Jay called to thank me. He said, "If you are ever in L.A. let me know and you can come by and drive the Turbine Car." Shortly after, I was standing in Jay Leno's Garage, his collection of cars and motorcycles, getting a tour before going out in the Turbine. I had arranged to write a story about this for Mopar Action magazine and was accompanied by Cliff Gromer, editor, photographer, writer. This day would be very well documented. Jay owns more than a hundred cars and probably just as many motorcycles. They all run, are plated and insured, and he drives them. He is often seen cruising around town in all manner of cars. We walked through the collection and Jay answered my questions, many of which were "What is this?" and "What is that?" There is no shame in asking, considering how eclectic the collection is. We stopped at the Turbine Car, which Jay had parked next to his other turbine car, the EcoJet. He also has a turbine-powered motorcycle.Each vehicle in his collection has a story and Jay knows them all. I felt like a talk show host quizzing him on the cars but he didn't mind. I suspect he enjoys talking about them almost as much as he likes driving them. Jay told me he had first seen a Turbine Car at the 1964 World's Fair in New York and had dreamed about owning one ever since. Now that he had one, it had gotten its share of driving. Jay fired the car up and pulled it out of the building. The car whooshes. People often describe the engine sounding like a big vacuum cleaner and in some respects that is pretty accurate. It is not loud, just different. I got in the passenger seat and we headed out. It was a beautiful sunny Saturday in Burbank. We had the windows rolled down and I took in the scenery. Jay Leno at the wheel of a Turbine Car and me in the passenger seat. I noticed that pedestrians would turn and look at the car before it passed them, drawn by the unusual sound. Some people noticed who was driving the car and waved. Jay waved back. This next photo is not the greatest I ever took but you will recognize that it is a Turbine Car. On the road. Taken from inside the car. We drove for a few miles and Cliff asked Jay if he knew of any nice open areas where we could photograph the car. Jay pulled into an office complex with a huge parking lot and took us around back. He stopped the car in the middle of an acre of asphalt and we all got out. As Cliff snapped pictures I noticed some activity near the building. Even though it was Saturday, there were apparently a few workers in the building who noticed that there was an unusual car out back being photographed with Jay Leno standing next to it. A few people came over and said Hello. As we were wrapping up, I mentioned to Jay that he had told me I could drive the car. I thought this was a good place to mention it since I could loop the parking lot and not risk harming anything, no matter how bad a driver I might be. I mean, Jay's a nice guy and all but I wouldn't expect him to let me drive this car in traffic. "Oh no." He handed me the keys. "Drive us back to the garage." Don't get me wrong: I was happy to drive the car anywhere but I had just assumed it was going to be a quick spin in a safe environment. I grabbed the key and got in. I turned the key and heard the turbine spool up. Soon, I was controlling the throttle that created the whoosh. I told Jay I had no idea where we were or how to get back to his garage so he would have to give me directions as we went. I pulled out of the parking lot and onto the road. The car handled a lot like my old Charger. The steering seemed light and the ride was nice. I tried to baby the accelerator, thinking of the cost of rebuilding an almost-50 year old turbine. When we got out onto a main road, I kept good distances between us and the cars in front of us and to the side of us and behind us. Heaven forbid I was the guy at the wheel if we got rear-ended. Eventually we made it back to the garage. I think I drove it about 5 miles but I didn't check the odometer. The whole time I was struck by how - if you couldn't hear the engine - you would have had no idea that there was anything different about this car. It was just a remarkably smooth ride. To create a cover photo, Jay pulled his Hemi Challenger out and parked it next to the Turbine Car. There was a Hemi Coronet about ten feet away from these two. It was amazing. As we were saying our goodbyes, Jay mentioned to me that "If it would help," he'd be happy to write a foreword for my Turbine Car book. It did help; he wrote the foreword. I also wrote an article for Mopar Action about the Turbine Car and Cliff wrote about the other Mopars in Jay's collection. My book was published by Chicago Review Press, as I mention in my bio at the bottom of these pieces. A little while later, Jay invited me back to talk about the book for a segment of his video series. <- There we talk about the car but it was the first visit where I got to drive the car. I've gotten to do some pretty cool things in my writing career, often involving cars and other modes of transportation (helicopter, B-17, Viper GTS, parachute, etc). But driving through Burbank In Jay Leno's Turbine Car clearly tops the list. Picture of me by Cliff Gromer as is the wonderful pic on the cover of Mopar Action. Steve Lehto is a writer and attorney from Michigan. He wrote Chrysler's Turbine Car: The Rise and Fall of Detroit's Coolest Creation and The Great American Jet Pack: The Quest for the Ultimate Individual Lift Device.